100% of precincts reporting (21,487/21,487). Beginning in 2024, requires that cap-and-trade revenues accumulate in a reserve fund until the Legislature, by a two-thirds majority, authorizes use of the revenues. Fiscal Impact: Beginning in 2024, potential temporary increase in state sales tax revenue, ranging from none to a few hundred million dollars annually, and possible changes in how revenue from sale of greenhouse gas emission permits is spent. Greenhouse gases are one of the main causes of climate change. These gases are produced by industrial activities and cars that run on gasoline. California has created many programs to reduce the amount of greenhouse gases, including a program called “cap-and-trade.” Certain companies must get a permit for each ton of greenhouse gases they create. Money from the sale of these permits goes into a state fund called the Greenhouse Gas Reduction Fund (GGRF). The state usually determines how to spend money from the GGRF as part of the annual budget process. This requires a simple majority vote by the legislature. 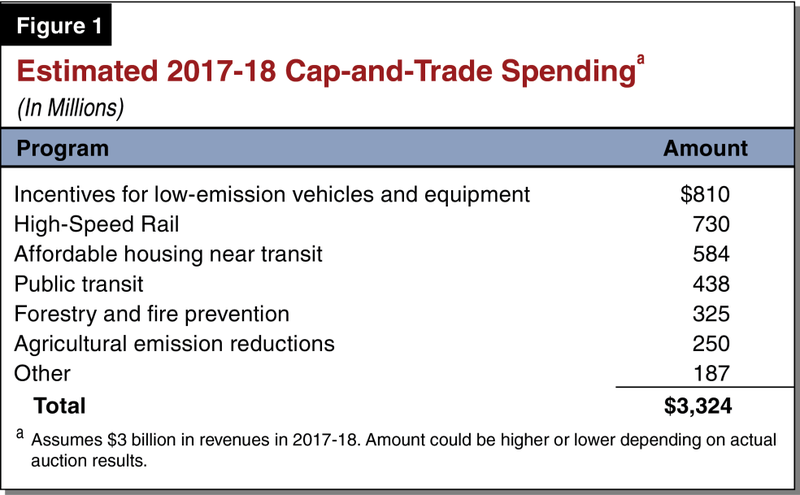 Beginning in 2024, money from the cap-and-trade program would go into a new state Reserve Fund. Money would be deposited into the Reserve Fund until two thirds of lawmakers from both houses of the Legislature vote to spend it. After such a bill passes, new money collected through the cap-and-trade program would go into the GGRF and could be spent by a simple majority vote. Prop 70 would also make a temporary increase in sales taxes for businesses that buy certain types of equipment. These taxes would go away once the Legislature votes to spend money from the Reserve Fund. Increasing the sales tax for certain business purchases could temporarily give more money to the state. The amount of money would depend on when lawmakers vote to spend money from the Reserve Fund. If lawmakers approve spending the money by early 2024, the state would get little or no additional money. If it takes a long time for lawmakers to pass a bill, the state would collect a few hundred million dollars each year. Money to reduce greenhouse gases should be spent in the wisest and most cost-effective way. Requiring a two-thirds vote protects the future of California’s historic climate change program. Requiring a two-thirds vote would make it far too difficult for lawmakers to reach agreement and pass a bill. Prop 70 would allow a small group of politicians to stand in the way of progress on climate change. Should (a) California’s cap-and-trade greenhouse gas reduction disbursements and (b) a related partial sales tax exemption be made subject to a two-thirds vote in the state Legislature in 2024 to continue the program and the exemption? Greenhouse gases (GHGs) including carbon dioxide, arising from sources like gasoline-powered cars and industry, contribute to climate change. One of California’s programs to reduce GHGs is referred to as "cap-and-trade," beginning in 2012 and continuing until 2030. The state issues a limited number of permits to emit GHGs, about half to be given away and half to be sold at auction. Companies must obtain a permit for each ton of GHG they emit. Permit auction receipts are deposited in a special Fund and are disbursed for GHG programs through the annual budget process, requiring a majority vote in both houses of the Legislature. The Legislative Analyst’s Office (LAO) estimates that about $3 billion will be disbursed from the Fund in 2017-18. California charges a sales tax on retail sales of most goods but not on the purchase of certain types of equipment through 2030. The LAO estimates that this exemption currently reduces state revenue by about $250 million annually. Prop.70 requires that, beginning in 2024, (a) cap-and-trade disbursements and (b) the sales tax exemption would be suspended until the state Legislature, by a two-thirds vote in both house (rather than by a majority), passes a bill authorizing both to continue. Thereafter, future disbursements would only require a majority vote and the exemption would be reinstated. The suspension of the sales tax exemption could increase sales tax revenue, by an amount dependent on the length of the suspension period. For a lengthy delay, the increase could be up to a few hundred million dollars annually. The 2024 two-thirds vote requirement could, temporarily, delay and/or change the mix of state and local programs disbursements compared to what would otherwise occur. The fiscal results are unclear. Prop. 70 forces two-thirds of the legislature reach agreement in 2024 to evaluate if the cap-and-trade has been beneficial for all Californians. Prop. 70 is part of a historic bipartisan effort to achieve our climate goals, retain good paying jobs to sustain our economy, and protect air quality and public health. The 2024 two-thirds vote requirement is not achievable, undermining clean energy progress, and empowering special interests out of step with most Californians. Prop. 70 was passed in only four days with a single committee hearing and no opportunity for public comment. Why was it passed with such speed and secrecy? Suspends certain tax exemptions, including for equipment used in manufacturing and research and development, beginning in 2024, until the effective date of any such authorization. Potential temporary increase in state sales tax revenue from the sale of manufacturing and certain other equipment beginning in 2024. Amount could range from no increase to a few hundred million dollars annually. Possible change in the mix of cap-and-trade funding provided to state and local programs. Program Aimed at Limiting Greenhouse Gases. California has several programs created to reduce the amount of greenhouse gases (GHGs) that are emitted. GHGs—such as carbon dioxide— contribute to global climate change and come from various sources, including gasoline-powered cars and industrial activities. One California program to reduce GHGs is referred to as “cap-and-trade.” Under this program, which began in 2012, the state issues a limited number of permits to emit GHGs. Certain companies responsible for large amounts of GHG emissions must obtain a permit for each ton of GHG they emit. The state gives about half of the permits away to certain industries for free and sells the other half at auctions. A recent state law allows cap-and-trade to operate in California through 2030. Revenue Collected Used for a Variety of Programs. Revenue collected from cap-and-trade auctions is deposited into a state fund called the Greenhouse Gas Reduction Fund (GGRF). The state determines how to spend money in the GGRF, usually through the annual budget process. The money in the fund is generally used for state and local programs to reduce GHGs. As shown in Figure 1, we estimate the state will spend about $3 billion from the GGRF on various programs in 2017–18. The state can spend money from the GGRF with a bill passed with majority votes in both houses of the Legislature. California’s state and local governments charge a sales tax on retail sales of most goods. Revenue from part of the sales tax goes to the state’s main operating account. This part of the tax is not charged when some businesses buy certain equipment used for such things as manufacturing and research and development. We estimate that this “manufacturing exemption” currently reduces state sales tax revenue by about $250 million annually. The exemption is authorized until July 1, 2030. Creates Temporary Higher Legislative Vote Requirement for Spending Cap-and-Trade Revenue. This measure requires that beginning on January 1, 2024, cap-and-trade revenue be deposited in a new state fund called the Greenhouse Gas Reduction Reserve Fund (Reserve Fund), rather than in the GGRF. These deposits would continue until the effective date of a bill that: (1) spends money from the Reserve Fund and (2) is passed by each house of the Legislature with a two-thirds vote (as opposed to the majority vote currently required). The measure also requires that money in the Reserve Fund be used to fund the same general types of programs that could be funded by the GGRF on January 1, 2024. After the effective date of the bill, future revenue would go back to being deposited in the GGRF and could be spent by a majority vote of the Legislature. Suspends Manufacturing Exemption Until Cap-and-Trade Revenue Is Spent. This measure suspends the manufacturing exemption beginning on January 1, 2024. While the exemption is suspended, the full sales tax would be charged when businesses buy certain equipment for such things as manufacturing and research and development. The suspension would continue until the effective date of a bill that: (1) spends money from the Reserve Fund and (2) is passed with a two-thirds legislative vote. Possible Change in Mix of Programs Funded. Beginning in 2024, the two-thirds vote requirement could, at least temporarily, change the mix of state and local programs funded by auction revenues compared to what would otherwise occur. Any change would depend on the future composition and spending priorities of the Legislature, which are unknown. As a result, it is unclear which state and local government programs might receive more or less money. A YES vote on this measure means: Beginning on January 1, 2024, revenue collected from the sale of state greenhouse gas emission permits would be deposited into a new special fund. These deposits would continue until the effective date of a bill that spends money from that fund, passed with a two-thirds vote of each house of the Legislature. The current state sales tax exemption for manufacturing and certain other equipment would be suspended during the same period that auction revenue is deposited into the special fund. A NO vote on this measure means: The Legislature could continue to authorize spending state revenue collected from the sale of greenhouse gas emission permits with a majority vote. The current state sales tax exemption for manufacturing and certain other equipment would remain in effect until July 1, 2030. VOTE YES ON PROPOSITION 70 TO PROTECT TAXPAYERS AND OUR ECONOMY AND ENSURE CALIFORNIA CONTINUES ITS LEADERSHIP ON CLIMATE CHANGE. California’s ambitious plan to reduce statewide greenhouse gas emissions PASSED WITH SUPPORT FROM DEMOCRATIC AND REPUBLICAN LAWMAKERS and more than 150 organizations representing agriculture; environment; clean energy and technology; business; labor; firefighters; public health professionals; economists; and newspaper editorial boards from across the state. PROPOSITION 70 HELPS ENSURE THAT MONEY FOR PRIORITY PROGRAMS IS NOT DIVERTED BY POLITICIANS FOR PET PROJECTS. It is essential that future climate change revenues continue to reduce emissions and provide benefits to all Californians. Proposition 70 provides a strong safeguard against any effort to undermine this goal. It forces two-thirds of the legislature to come together in 2024 to evaluate if the money has been spent wisely and beneficially for the good of all Californians. PROPOSITION 70 SAFEGUARDS CALIFORNIA’S HISTORIC CLIMATE CHANGE PROGRAM WHICH PROTECTS OUR ENVIRONMENT, ENHANCES OUR ECONOMY, AND CREATES JOBS. The future of California’s signature climate change program depends on demonstrating that we can protect our environment while growing our economy. To accomplish this goal Proposition 70 helps ensure that the money to reduce greenhouse gases is spent in the wisest and most cost effective way; that protects taxpayers and our most polluted communities. Proposition 70 is part of a historic bipartisan effort to achieve our climate goals, retain good paying jobs to sustain our growing economy, and protect air quality and public health. Proposition 70 grew out of an oil industry-backed effort to derail the state’s premiere program to curb harmful air pollution. According to the Los Angeles Times, the industry spent millions of dollars lobbying to water down California’s commitment to clean air policies that reduce our dependence on high-polluting fossil fuels. Proposition 70 will increase legislative gridlock, undermine our clean energy progress, and empower special interests who are out of step with the majority of Californians. It doesn’t deserve your support. A key component of California’s clean air strategy is a program called Cap and Trade that requires polluters to reduce their emissions or pay into a fund. This fund is used to increase energy efficiency in homes, businesses and schools, provide consumer rebates that make electric and hybrid cars more affordable, increase public transit, clean up dirty, heavy-duty trucks that pollute neighborhoods, and other successful anti-pollution programs. By requiring a 2/3 supermajority vote of the legislature to allocate the funds paid by polluters, Proposition 70 would change this effective system and empower a small minority of politicians to divert the funds away from environmental priorities and prevent them from being spent to reduce pollution and provide needed transportation, housing and energy services to our communities. Californians will remember the painful deal-making to pass a state budget when that also required a 2/3 vote. Many months passed without a budget, and the deals became more desperate and more compromised by special interests as time passed. The voters put an end to that dysfunction back in 2010 when they changed the vote required for a budget to majority. We shouldn’t return to that broken system. Proposition 70 was the result of a backroom deal. Normally, it takes about nine months for a bill to pass the legislature. Measures typically have several hearings with the details studied and discussed. In contrast, Prop. 70 passed in only four days, without any hearing and without any opportunity for public comment. If it were such a great idea, why was it rushed through in secrecy? The oil companies and a small group of politicians support efforts like Proposition 70 that weaken our state’s clean energy policies. Opposing Proposition 70 are good government groups like the League of Women Voters of California, and the state’s most respected environmental and social justice organizations including the California League of Conservation Voters, Natural Resources Defense Council, Coalition for Clean Air and California Environmental Justice Alliance. The Sierra Club California says the law behind this ballot measure would “delay urgent expenditures for climate, air quality, and other identified statewide and local priorities.” We urge you to vote No on Proposition 70 because it’s bad for the environment, bad for our economy, bad for good government, and could undo years of progress toward a cleaner future. Learn more about why Proposition 70 is bad for California at www.stopprop70.org. Proposition 70 is a mistake. It is bad for the environment and bad for public health. That’s why 35 respected environmental organizations like the Natural Resources Defense Council, the California League of Conservation Voters and the Coalition for Clean Air all say vote NO on Proposition 70! Proposition 70 is undemocratic. It would let a small group of politicians who have opposed our successful clean air strategies derail progress on climate change and pollution reduction. We can’t allow that to happen. There is too much at stake for our health, our planet and for future generations. Big oil companies and other industries that cause our worst pollution want Proposition 70 so they can sideline pollution reduction programs and keep poisoning our air and water. These special interest groups have opposed progressive measures to address air pollution and climate change for many years. Many Democrats and Republicans in the legislature opposed putting Proposition 70 on the ballot because it’s a bad deal for California. Join NextGen California, Physicians for Social Responsibility Los Angeles, California Environmental Justice Alliance, Friends of the Earth, the Courage Campaign, the League of Women Voters California and many more groups that are fighting for the public interest and a clean future in voting NO on Proposition 70! Proposition 70 opponents are misleading you. It is supported by Democrats and Republicans because it helps guarantee the money from California’s signature climate change program is only used to reduce pollution, protect the environment and enhance our ability to respond to wildfires. LEFT UNPROTECTED THESE MONEYS WILL BE VULNERABLE TO SPECIAL INTEREST INFLUENCE. Proposition 70 is a critical piece of an HISTORIC BIPARTISAN AGREEMENT to achieve our ambitious climate goals, retain good paying jobs that sustain our economy, and address important public health and air quality issues. It is not a recipe for gridlock and it HAS NO IMPACT ON THE STATE’S MAJORITY VOTE BUDGET REQUIREMENT. Do not be fooled by the opponents’ misleading arguments. The projects funded by our climate change program enhance our ability to manage the state’s destructive wildfires by providing fire engines for fire prevention and improving the health of California’s forests; assist farmers in making changes needed to reduce harmful pollution; help residents make their homes more energy efficient; and improve air quality for millions of Californians in our most polluted communities. THE PURPOSE OF PROPOSITION 70 IS TO MAKE SURE THAT HIGH QUALITY AND COST-EFFECTIVE PROGRAMS LIKE THESE CONTINUE TO RECEIVE FUNDING. That is why organizations representing agriculture; environment; business; labor; firefighters; and public health professionals all supported the plan. VOTE YES ON PROPOSITION 70 TO PROVIDE THE CHECKS AND BALANCES TAXPAYERS DESERVE AND SAFEGUARD CALIFORNIA’S HISTORIC CLIMATE CHANGE PROGRAM as we protect our environment, enhance our economy, and create jobs. This amendment proposed by Assembly Constitutional Amendment 1 of the 2017–2018 Regular Session (Resolution Chapter 105, Statutes of 2017) expressly amends the California Constitution by adding a section thereto; therefore, new provisions proposed to be added are printed in italic type to indicate that they are new. SEC. 24. (a) The Greenhouse Gas Reduction Reserve Fund is hereby created as a special fund in the State Treasury. (b) For the time period specified in subdivision (d) only, all moneys collected by the State Air Resources Board from the auction or sale of allowances pursuant to a market-based compliance mechanism established pursuant to the California Global Warming Solutions Act of 2006 (Division 25.5 (commencing with Section 38500) of the Health and Safety Code) shall be deposited in the Greenhouse Gas Reduction Reserve Fund. (c) Notwithstanding any other provision of this Constitution, moneys in the Greenhouse Gas Reduction Reserve Fund shall be available upon appropriation by the Legislature by rollcall vote entered in the journal, two-thirds of the membership of each house concurring, for the same purposes applicable on January 1, 2024, to the Greenhouse Gas Reduction Fund, created pursuant to Section 16428.8 of the Government Code. (d) Subdivision (b) shall apply beginning January 1, 2024, and until the effective date of legislation that contains an appropriation from the Greenhouse Gas Reduction Reserve Fund. After the effective date of that legislation, all new moneys collected pursuant to a market-based compliance mechanism shall be deposited in the Greenhouse Gas Reduction Fund, created pursuant to Section 16428.8 of the Government Code. (e) Section 6377.1 of the Revenue and Taxation Code shall not apply to sales that occur while the moneys specified in subdivision (b) are being deposited in the Greenhouse Gas Reduction Reserve Fund, but shall resume on the effective date of legislation identified in subdivision (d). Social and Environmental Entrepreneurs, Inc.